Lauffeld between Tongeren and Maastricht. 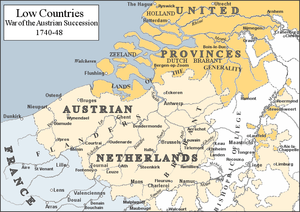 Low Countries: War of the Austrian Succession. Lauffeld is in the center right. 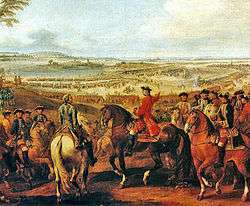 The Battle of Lauffeld, also known as Lafelt, Laffeld, Lawfeld, Lawfeldt, Maastricht or Val, took place on 2 July 1747, during the French invasion of the Netherlands. It was part of the War of the Austrian Succession. 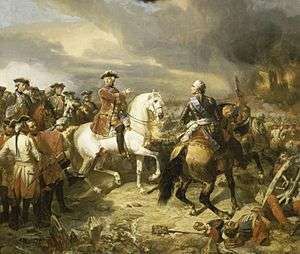 Marshal Saxe led the French forces against the Pragmatic Army, the combined forces of the British and Hanoverians under the banner of the Duke of Cumberland, and the Dutch Republic, fighting under the Prince of Orange, at Lauffeld (or Lafelt, now part of Riemst), just west of Maastricht. Cumberland moved to defeat a detachment of the French army commanded by the Prince of Clermont that de Saxe had sent to bait the Pragmatic Allies into moving. Then Saxe force-marched the main French force to the ground he had chosen, thus outmaneuvering them. Cumberland now not only faced the entire French army, but further compromised his chances of success by ignoring General John Ligonier's advice to occupy and fortify a line of villages across the front of the allied army. Once again, as at the Battle of Rocoux, the Austrians on the right refused to move against the open French left flank. 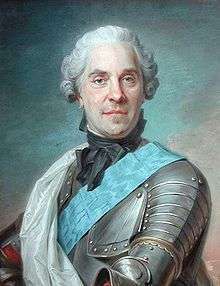 The French made five assaults on Lauffeld and the villages changed hands several times, until Saxe gained the upper hand. A large French column drove the 10,000 British and Hessian defenders out of the village of Lauffeld a final time. Cumberland reorganized the Dutch and British for a counter-attack; however, the Dutch cavalry was broken by the charge of the French Carabiniers and fled from the French cavalry, throwing the infantry behind them into disorder. The French cavalry then pierced the allied center. Now, a general French advance began to turn the Allied left flank, threatening the annihilation of the British infantry. General Ligonier, on his own initiative, then led the cavalry in charges that would save the army. The greatest cavalry engagement of the war ensued with over 15,000 horsemen charging and counter-charging. Seven regiments of the Irish Brigade in the French service lost over 1400 killed or wounded. The Allied commander, H.R.H. The Duke of Cumberland, George II's favourite son was nearly taken prisoner by the Irish, as in the confusion of battle he mistook the red-coated Irish Brigade for his own troops. Ligonier came up with a large body of horse, enabling Cumberland to escape but at the loss of his own liberty. It was a French victory that left the gateway to the Dutch Republic open to invasion and the Dutch at the mercy of the French. The allied retreat allowed Saxe to send a detachment of 30,000 troops under Count Lowendahl north across the Low Lands, capturing the city of Bergen-op-Zoom to finish that year's campaigning season. 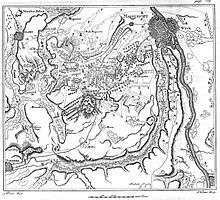 At the opening of the spring campaigning season of 1748, the French invested Maastricht and, after a brief siege, the city fell on 7 May. The city's siege started negotiations in April, ending the war in October 1748 with the Treaty of Aix-la-Chapelle. Maurice de Saxe's long series of victorious campaigns, sieges, and battles in the Low Lands ensured France's position as the dominant land power in the peace negotiations, during which the sound of Saxe's siege guns could be heard pounding away at the city of Maastricht. ↑ Paul Langford (1998). A Polite and Commercial People: England 1727-1783. Oxford University Press. p. 209. ISBN 978-0-19-820733-7. Retrieved 20 April 2013. "The oriflamme and the Chape de St Martin were succeeded at the end of the 16th century, when Henry III., the last of the house of Valois, came to the throne, by the white standard powdered with fleurs-de-lis. This in turn gave place to the famous tricolour" (Chisholm 1911, p. 460). ↑ History of England, Phillip Henry Stanhope, p. 333, "The number of killed and wounded, on both sides, was very great, and nearly equal." ↑ Skrine, Francis Henry.Fontenoy and Great Britain's Share in the War of the Austrian Succession 1741-48. London, Edinburgh, 1906, p.331. ↑ Skrine, Francis Henry.Fontenoy and Great Britain's Share in the War of the Austrian Succession 1741-48. London, Edinburgh, 1906, p.332. ↑ Williams, Hywel (2005). Cassell's Chronology of World History. Weidenfeld & Nicolson. ISBN 0-304-35730-8. ↑ Ligonier was a French professional soldier who commanded the British cavalry in Cumberland's battles. ↑ Smollett, Tobias. History of England, from The Revolution to the Death of George the Second, London, 1848, Vol.II, p.524. Chisholm, Hugh, ed. (1911). "Flag". Encyclopædia Britannica. 10 (11th ed.). Cambridge University Press. pp. 454–463. "The Vinkhuijzen collection of military uniforms: France, 1750-1757". New York Public Library. 25 March 2011 . Archived from the original on 8 March 2013. Smith, Whitney (1975). Flags through the ages and across the world. England: McGraw-Hill. pp. 114–119. ISBN 0-07-059093-1. Stanhope, Phillip Henry, Lord Mahon. History of England From the Peace of Utrecht to the Peace of Versailles., Boston, 1853, Vol.III. Skrine, Francis Henry. Fontenoy and Great Britain's Share in the War of the Austrian Succession 1741-48. London, Edinburgh, 1906. McGarry, Stephen. Irish Brigades Abroad. Dublin, 2013.